Henry Holt and Co. (BYR), 9780805098761, 48pp. 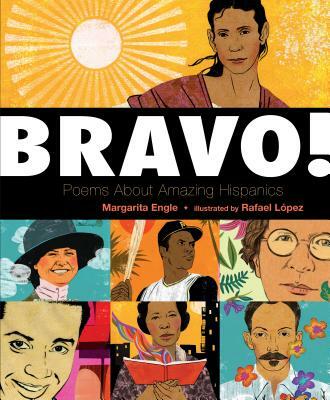 Musician, botanist, baseball player, pilot—the Latinos featured in this collection, Bravo!, come from many different countries and from many different backgrounds. Celebrate their accomplishments and their contributions to a collective history and a community that continues to evolve and thrive today! The work of Rafael López is a fusion of strong graphic style and magical symbolism. Growing up in Mexico City, he was immersed in the rich cultural heritage and native color of street life. He has illustrated many award-winning books, including Book Fiesta! by Pat Mora; Tito Puente Mambo King, by Monica Brown; and The Cazuela that the Farm Maiden Stirred by Samantha Vamos. In 2012 he was selected by the Library of Congress to create the artwork for the National Book Festival in Washington D.C.
"Lopez's bright portraits of notable Hispanics have the large scale and graphic discipline of poster art, while Engle manages to compress the sweep of a biography into a sharp, compact free-verse poem about each life, from childhood on. Some are famous [...] All faced challenges [...] and made lasting contributions." —New York Times Book Review on Bravo! "this book is a welcome addition to schools and libraries, as it expands the canon of historically significant individuals in the United States in such a lyrical and aesthetically pleasing manner." —School Library Journal, starred review, on Bravo! "This book features the lives of a variety of Latinos who faced life's challenges with aplomb and in their own ways. . . each person is stunningly portrayed in López's strong and vibrant style; opposite is a first-person biographical poem that provides a glimpse into its subject's life." —Kirkus Reviews on Bravo! "López (who illustrated Engle’s Drum Dream Girl) creates bold, dramatic portraits of the subjects, which include José Martí, Pura Belpré, Tito Puente, and César Chávez. Capsule biographies are a welcome supplement to the poems" —Publishers Weekly on Bravo!